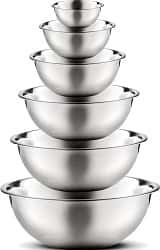 Are you baking treats with your kiddos or just whipping out some chocolate chip cookies for Sunday treat, you will always need the best stainless steel mixing bowls to keep your ingredients ready. From simple plastic bowls with lids to beautiful retro-themed ceramic sets, mixing bowls come in different types. Mixing bowls are one of the must-have accessories for your kitchen. They can be used to mix batter, toss salad, sift through ingredients, and various baking needs. You can find some good mixing bowls of different sizes or even individual bowls. Along with price, also consider how it is made of and what material is best for your baking needs. Most of the mixing bowls are made of plastic because they are known to be affordable. Make sure they are scratch resistant and don’t absorb odors as well. Some mixing bowls are made of glass which are usually durable and can withstand freezer and microwave. But they may shatter when dropped. Stainless steel is one of the best materials for mixing bowls. These bowls are both affordable and durable and they look very beautiful on countertop. They are also not reactive like metal and won’t leave metallic taste on your food. 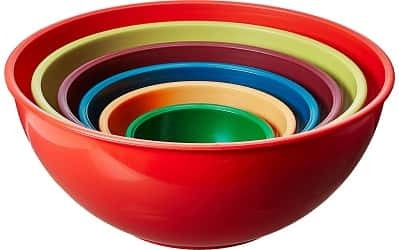 Listed here are some of the best kitchen mixing bowls for your needs and budgets. You can choose from widest range of mixing bowls. FINEDINE stainless steel bowls are timeless and classic to serve different purposes of food preparation. This set contains 6 bowls to perform different kitchen tasks like tossing, mixing, whisking, serving and prepping. These bowls are definitely a kitchen staple as they are made of scratch-resistant stainless steel that also resist bumps for shiny finish that lasts longer. Unlike plastic or wood, there is no risk of cross-contamination by absorbing bacteria and foul odor with stainless steel and your food will taste crisp and fresh every time. The bowls are freezer and refrigerator safe for preparing salads or prepping meats. These are also dishwasher safe or you can wash by hand. These colorful mixing bowls from OXO Good Grips are best for mixing batter, whisking eggs and making marinades. The set includes one 1.5” bowl, one 3” bowl and one 5-quart bowl, which features comfy, soft, non-slip, and easy to grip handles. The bowls are stabilized with non-slip bottoms when mixing and wipe spouts and lips are easier to pour liquids. 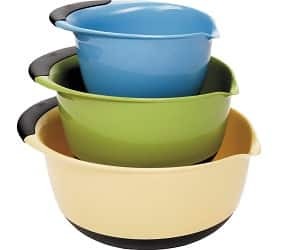 These bowls come in beautiful green, blue and yellow colors and they nest well for easy storage. With Pyrex Glass Mixing Bowl Set, mixing and stirring jobs have become a breeze. 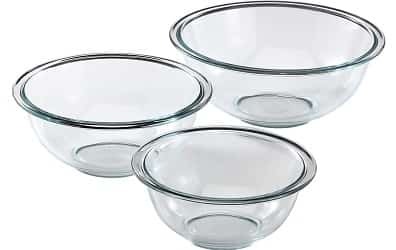 The 3-piece bowl set includes one 1-quart, 1-1/2-quart, and 2-1/2-quart glass mixing bowls made of Pyrex glass. All of these bowls are safe to be used on freezer, dishwasher, microwave and preheated oven. These bowls are made of non-porous glass which won’t stain, warp, or absorb flavors and food odors. These bowls are best suited for your cooking needs and their round shapes are meant to maximize space for mixing and stirring. These glass bowls are made in USA and come with limited 2-year warranty on manufacturing defect. Pyrex Smart Essentials Clear Mixing bowls are transparent for easy monitoring of baking. These durable bowls have good heat conduction for consistent, even baking. These are the original glass bakeware for your kitchen. 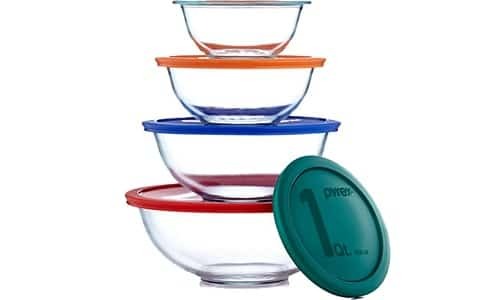 This 8-pc bowl set includes 1-qt, 1.5-qt, 2.5 qt, and 4 qt mixing bowls with blue, orange, green and red plastic lids. It comes with 1 year limited warranty on covers and 2 year on Pyrex glassware. 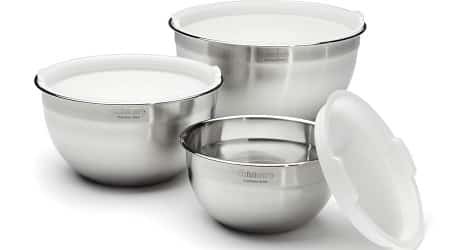 FineDine Premium Stainless Steel mixing bowls are long-lasting and serve different purposes. These bowls are very versatile to serve different purposes, such as mixing, beating, storing and marinating. The build quality of each bowl is what sets FineDine apart from the rest. These bowls are made of heavy gauge stainless steel which offer superior resilience and durability and they are dent and rust resistant and shatterproof. These bowls come in different sizes and they are wide with deep interior. These classic mixing bowls from KitchenAid are best tools for a modern kitchen. The set includes 1.5 qt, 2.5 qt, 3.5 qt, 4.5 qt, and 5.5 qt bowls. With non-slip bases, these bowls provided added stability when mixing. Each bowl has pour spout to reduce spills when pouring mixes. They also nest well for easy storage. They are also easy to clean up in dishwasher. In addition, these bowls also come with hassle-free 1-year replacement warranty and lifetime limited warranty. This mixing bowl set from Gourmet Home Products covers everything you need, whether you need a small bowl just for dip or a large one for mixing ingredients well. Made of polypropylene, this mixing bowl set is the best choice for all your kitchen needs. These bowls are made of heavy-duty and durable polypropylene plastic so they are microwave, dishwasher and freezer safe. The bowl set includes bowls in different sizes from 0.32 qt. to 5.8 qt. They come handy for any kitchen task or camping. Each set contains dazzling and bold colored bowls. They are also very easy to store as they nest together. 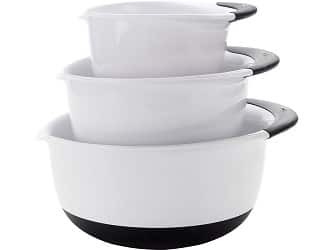 With OXO Good Grips 3-Piece mixing bowl set, you no longer need to waste your time juggling mismatched bowls. The set includes everything you need. The set includes 1.5-qt, 3-qt, and 5-qt mixing bowls which are good for whisking dressings or eggs, serving popcorn and tossing salads. You can even pair it with electric mixer. Each bowl has soft, comfortable grip and non-skid bottom. 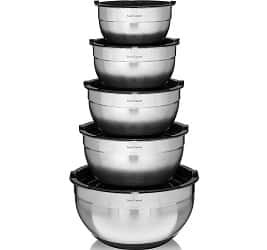 This set of 3 stainless steel mixing bowls are designed well to nest together for easy storage and they also have air-tight lids to store your leftovers in freezer or refrigerator without any hassle. It features three sizes of bowls to do any task which needs a bowl. These bowls are made of sturdy material which is food-grade and keeps your contents safe for longer. 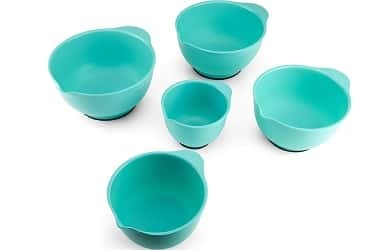 If you need the best set of mixing bowls for your kitchen, this 5-piece mixing bowl set from Simply Gourmet is your best bet. You will definitely love the tight fitting lids and quality of stainless steel. Glass bowls can shatter and plastic bowls can warp, bend and even melt. But these stainless steel bowls are built to last. This set can serve different purposes, whether storing leftovers or preparing salad. Along with being functional and stylish, they are also dishwasher-safe. The Material Which Goes into the Making: It is of utmost importance that you be careful about the material that is used for the making of the mixing bowls. If you go for something that will save a lot of money for you, you will probably go for something that is made of plastic. But the same shall not be useful. You also have to see the side effects of using a mixing bowl that is made of this material. Instead of plastic, the bowls made of glass is a better option. There are many uses of the mixing bowls made of glass. Mixing bowls made of stainless steel can also go a long way in helping you get the best of experiences in your kitchen environment. Durability: Another important factor that you will have to consider at the time when you are going for the purchase of the mixing bowl is the fact that whether or not the mixing bowl will go on for a long time. If you invest in something, you definitely will want it to run for a long period of time so that you can extract the maximum value out of it. It is for this reason too that many people are looking for mixing bowls that are made of stainless steel. This material is much more durable than plastic or even glass. Size of the Mixing Bowls: Another important factor while you go for the purchase of the mixing bowl in the market that should be considered by you is the size of the bowl itself. Depending on your needs and the number of members in your family, you should decide upon the size. Too large it will unnecessary occupy a lot of space and too small it will not really serve the purpose for which it has been bought. Also keep in mind that you will need mixing bowls of different sizes for performing different functions in the kitchen. Ease of Handling: One of the most important considerations is whether or not your mixing bowl is easy to handle. For this purpose, you also need to check the size of the handle. The base and width of the bowl should also be proper. Price: If you are going for the purchase of a mixing bowl, bear in mind the price of the same and the corresponding budget that you must have allocated for the mixing bowl. There are many varieties available in the market that comes in different shapes and sizes. Each will have different price. But you shall have to be smart and choose something that will not only best suit your needs but will also refrain you from making a hole in your pocket. Clean it Gently with Hands: Most of the mixing bowls that we see in the market today are such that they are safe enough to be washed in a dishwasher. However, in order to retain the long life of the mixing bowls, it is highly recommended that you use your hands to wash and clean the mixing bowls. In order to remove the extra oil or dirt that might have been accumulated on the bottom of the mixing bowl, it is first recommended that you keep it in warm water for some time. Now the dirt can be removed easily. Use a mild soap and brusher to wash the mixing bowls. Use Stainless Steel Cleaners: As pointed above, one of the best materials of choice to go into the making of the mixing bowls is the stainless steel. Hence, while cleaning the same, it is highly recommended that you use the stainless- steel cleaner which will keep the material safe and will also ensure greater durability. Store in a Dry Place: After you have washed your bowls, ensure to keep them in a dry place. Thus, the above article is an attempt to help you with the buying, caring, and cleaning guide for the mixing bowl! There are different brands and models of mixing bowls available to choose from. These mixing bowls listed above come from the top brands that you can buy for sure and benefit from the quality and stability they provide. Each product has its own special feature that will meet your baking needs. => You might also like to see Best Bakeware Set reviews.